As news of outbreaks of disease continues to swirl around the world, I keep being reminded of the bravery of the caregivers who bring comfort and aid to the sick and the dying. In the Middle Ages, this would have been local healers, but very often priests, who would have been called to visit people near death in order to hear their confessions, and administer their last rites. During The Black Death of 1347 (and the years following), priests were faced with the task of stepping into sickrooms, knowing that they faced an unseen enemy that very likely would kill them shortly. That thousands of priests took those steps anyway, risking their lives to give hope and comfort to those in pain and fear is something I can’t help but admire all these centuries later. The period of The Black Death was a troubling one for members of the religious community, and faith in the Church as an institution was shaken to its core. The public demanded an explanation for the plague all around them, and while there was a sense it might be punishment for sin, there seemed to be no rhyme or reason to it. Confidence in the power of shrines and talismans that had brought comfort for decades was shattered, and fearful priests who shirked their duties were held up as examples of the clergy’s failings as a whole. Cloistered communities were the perfect breeding ground for plague, with whole monasteries and abbeys being wiped out. It seemed the Church had no answers, but this did not stop vast amounts of local priests from doing all they could to give their parishioners spiritual solace as they faced their deaths. 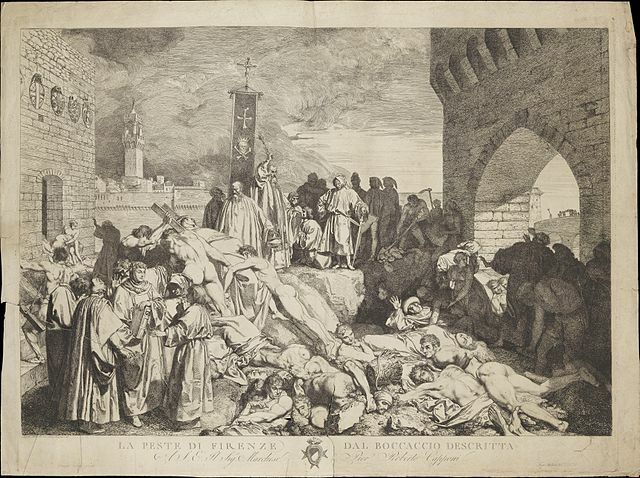 In The Great Mortality, John Kelly says that the mortality for priests during The Black Death was “42 to 45 percent” (p.224), which is higher than the overall mortality rates seem to be for the general population (the death rate has been hotly debated for centuries, but general consensus seems to be around 30%). Clergy who cared for the sick were dying at a high rate, and no wonder: the sheer exhaustion and repeated exposure of moving from home to home at all times of day and night to visit the dying would have made priests especially vulnerable. Because there were so many ill, and so few priests remained as the disease progressed, Clement VI declared that the dying could make their confession to anyone present – “even to a woman”, said an English bishop (Tuchman, p.94) – and that it would still lead to salvation. This was a big deal for the Church, as previously only clergy were permitted to perform last rites. As Barbara W. Tuchman writes in A Distant Mirror: The Calamitous 14th Century, “Clement VI [later] found it necessary to grant remission of sin to all who died of the plague because so many were unattended by priests” (p. 95). The priests were doing what they could, but they were paying with their lives. In the aftermath of The Black Death, the Church’s reputation never quite recovered, as the new priests who were quickly brought in to fill the void were not as scholarly or thoroughly trained as the old. It became more acceptable to malign the clergy in the years that followed, as Chaucer so bitingly does with his Summoner and Pardoner in The Canterbury Tales, and devotion became more personal and insular. Nevertheless, while it’s easy to be cynical of medieval Christianity, I think it’s worthwhile to take a moment to put ourselves in the shoes of those people who faced their own deaths in order to bring others comfort, whatever that may have been. Priest or layman, man or woman, it takes bravery and selflessness to expose yourself to that risk, so these five minutes are for those people on the front lines, past and present.